Some weekends are quiet event-wise and other weekends are jam packed with shows. This weekend is very much the latter so let's highlight just a few shows taking place and get Ready For The Weekend. On Friday night, HOPE Wrestling are kicking off a double show weekend to celebrate their second anniversary. 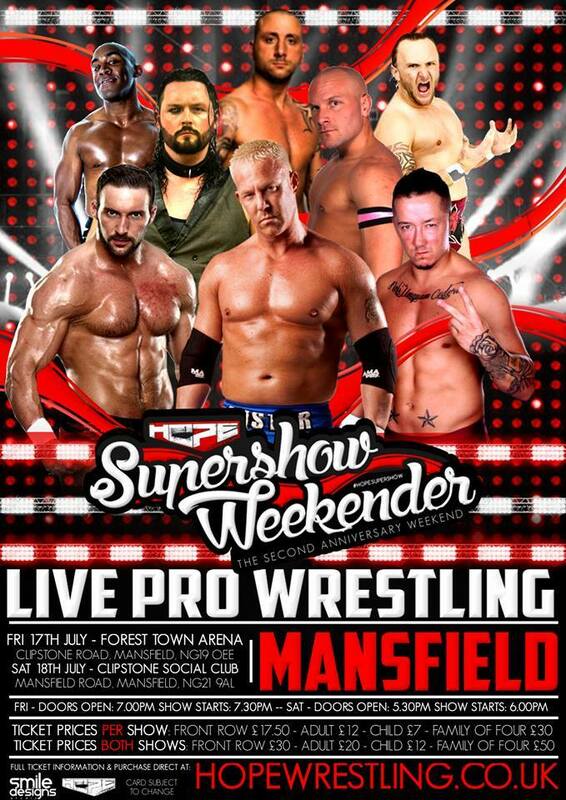 Night one of their supershow weekend takes place at the Forest Town Arena in Mansfield. Right at the top of the bill is a six-way match to crown the first ever HOPE champion with every competitor (Joseph Conners, El Ligero, Ryan Smile, Jack Jester, LJ Heron & Chris Tyler) in the match in with as much chance as the next of taking the championship home. Also on the show is 'The Masterpiece' Chris Masters taking on the behemoth that is Big Damo. Very few matches take place where Masters could be considered the smaller of the two but Damo really is that big! In a match which could be the one that everyone remembers most, Joey Hayes takes on 'Global Hero' Joe Hendry. In fact the match has so much potential, we'd go to the show just for it. 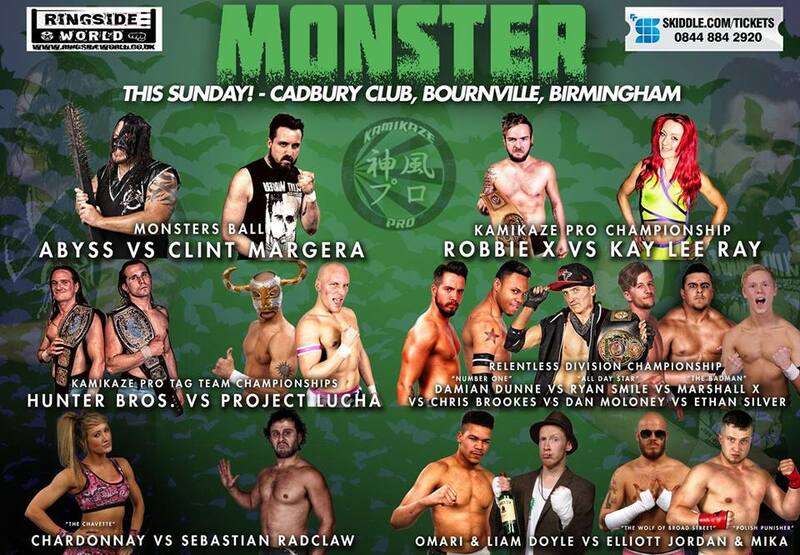 Also competing on the card are Lionheart, Bubblegum, Martin Kirby, Viper, Jimmy Havoc, Viper and a whole lot more. HOPE Wrestling returns on Saturday also, with another show in Mansfield, this time at the Clipstone Social Club. Moving on to Saturday and Southside Wrestling are back in Stevenage with Great Expectations. Now this show is well named as it is dripping with goodness! First up we have 'The Righteous' Joseph Conners defending the Heavyweight Championship against the returning Rockstar Spud in the main event. Now Conners is good, in fact he is great. However he is also very cunning and clever when it comes to competing. On Saturday, he is facing a man who has spent time in the ring with some of the finest wrestling talent in the world, most notable Kurt Angle in recent weeks. This could well be the biggest test yet for the leader of The Righteous Army. Speaking of The Righteous Army, Kay Lee Ray will compete against one of the best and most decorated champions in professional wrestling in the shape of Gail Kim. Kay Lee Ray has faced some of the best wrestlers around, she herself is one of the best wrestlers competing today, the question is, which one of these two is coming out on top? If the last match is guilty of being too close to call, then the Monsters Ball match between Abyss & Jimmy Havoc is guilty of being too violent to imagine. It's incomprehensible as to what these two men will do to each other in Stevenage. Both appear to enjoy the feeling of pain as much as dishing it out the their opponent. Will it be the man who invented the Monsters Ball match, Abyss or will be it the man who says he can't be killed as he is already dead inside, Jimmy Havoc? On Saturday, we find out. 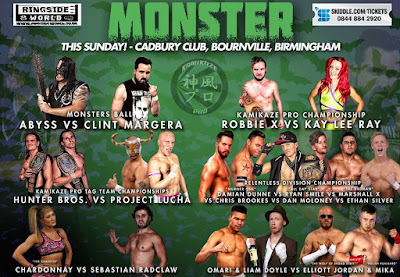 Sunday sees Kamikaze Pro back at the The Cadbury Club in Bournville, Birmingham for Monster. One of the stand out matches scheduled for the show is The Hunter Brothers defence of the Kamikaze Pro Tag Team Championship against the duo of Martin Kirby and 'The Mexican Sensation' El Ligero. The Hunter Brothers are easily one of the best tag teams in th UK right now. But their opponents, have had a good amount of success as a tag team in the past. This is a challenge for The Hunters and a great opportunity for Project Lucha. On the theme of a challenge, the biggest one could in front of Marshall X this Sunday as he'll be defend the Relentless Division Championship against five other men. And these men aren't just somebody you've never heard of before. Damian Dunne, Ryan Smile, Chris Brookes, Dan Moloney and Ethan Silver would all provide a challenge individually. Having all five in the same match makes Marshall X's challenge his greatest yet. Now we try to describe a match the best we can, however we don't think there are words to describe the match of Sebastian Radclaw vs Chardonnay. It could be technical, it could be high-flying, it will undoubtedly be unmissable! Add to that another appearance from Abyss, this time tackling death match specialist Clint Margera and you've got one of the strongest card's we've seen out of the promotion.